With the development of China's industrialization process, steel sheet piling more and more frequent, in China there have been growing demands. However, it is whether the manufacturing process of emerging industries of steel sheet piling in the technical standards, the industry standard for the investigation stage, there are many shortcomings and places worth exploring. At present, the domestic demand, based on the major Larsen III, IV No. 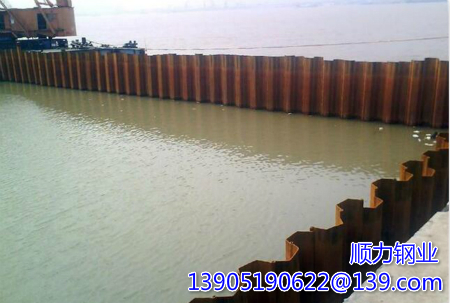 steel sheet piling, we are dependent on imports. Products in the submarine pit use, not only bending thickness due to the impact of the strong alternative and hat cold- formed steel sheet piling locking the impact of technology and other factors, the cost has led to an increase in the amount of no defects, high form a coherent precision irreversible, can not control lack of necessary conditions to promote a wide range of applications. At the same time, a unified industry standard domestic steel sheet pilings and rules do not exist, the application of domestic steel sheet piling has been severely limited, it does not form a complete system. Classification is what, and when using steel sheet piling construction method? 4、the pile hammer piling method.